Let's hope it's a more grammatically satisfying year than the one just finished, although with this effort, spotted today out at Bargara, I'm not encouraged. Not to mention the 'breakfast, lunch and diner' notice we saw at one of the local cafés. 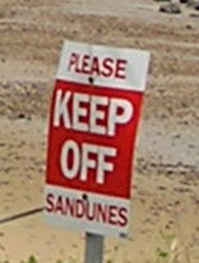 Surprisingly "sandunes' scores 31,000 hits compared to 2,740,000 hits for "sand dunes" so there's hope yet. After a brief stroll along the front, dodging a few squalls, we made a dash for a table at one of our favourite lunch spots where we copped a hiding from the old public holiday surcharge routine, $25 for two coffees and a piece of apple pie each. Nice though the apple pie was, in between the surcharge and the obvious lack of local spelling abilities, my spirit of optimism for the New Year is already seriously strained. Bloody surcharge. That's one reason to avoid eating out on Public Hols in Qld. I can't recall paying surcharges on Public Holidays in Victoria.